I am genuinely jubilant in presenting my first paper in SCN. As this is my first paper, humbly request you to correct me if you find any mistakes . With the release of OP edition 1610, SAP has optimized the functionalities in an efficient manner. Here by I would like to furnish the glimpse of innovations in ML functionality. Material Ledger activation is mandatory for Material Valuation in all S/4 HANA On-Premise releases and becomes now part of the standard- On premise release 1610. However activation of Actual Costing functionality is still optional. We know the fact that for materials with price control Standard price, statistical moving average price gets calculated and this requires exclusive locking eventually limiting the data through put in the sap system. To get rid of this , deactivation of statistical moving average price is imperative. It is important to note that the Deactivation of statistical moving average price is not reversible. Then you might question, what about the materials with price control – V? Answer is Transaction data throughput is still limited by exclusive locking. Note: If Actual Costing is active, the aforesaid fields will still be updated with the periodic unit price during the Actual Costing Closing Steps. Finally, the report SAPRCKM_NO_EXCLUSIVELY_LOCKING can be used to deactivate the statistical moving average price. This can be done for converted systems running the S/4HANA on-premise edition. In the S/4HANA cloud edition or new installs of the SAP S/4HANA on-premise edition, the statistical moving average price is disabled by default. After activation of Actual costing, Data conversion to S/4 HANA data structures could be done via program FCML4H_STARTUP or via transaction FCML4H_STARTUP. It is not allowed to use a ML Type that references to currency settings defined in FI or CO (flags Currency Types from FI, Currency Types from CO). There is no default Material Ledger Type 0000 anymore. Instead you have to define explicitly the currency and valuation types that are relevant for Material Ledger. Define Material Ledger type in transaction OMX2. Assign corresponding Material Ledger type to valuation area in OMX3. Activate Material Ledger for corresponding valuation area in OMX1. 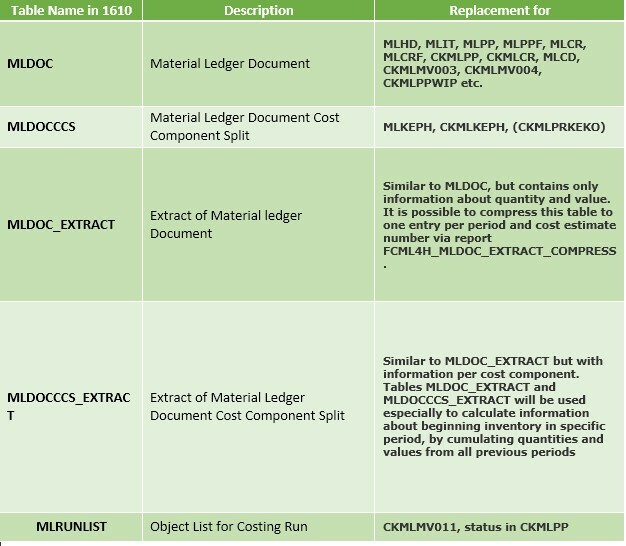 The Material Ledger Closing Document is stored in the former ML document tables (ML*). Standard Price. Periodic Unit Price and Price Control are still managed in table CKLMLCR. Single- and multilevel differences are no longer distinguished. In table MLDOC all price/exchange rate differences are stored in fields PRD/KDM. In table MLDOCCCS the CCS for price/exchange rate differences are stored under the CCS types E/F (field MLCCT). The CCS is stored in a table format using the cost component (field ELEMENT) as additional key. This allows increasing the number of cost components without modification. The CCS for preliminary valuation is always stored. Note: Individual processing steps such as Single level price determination, Multi level price determination, Revaluation of Consumption, Work in process revaluation has been concatenated into single step as Settlement. The section “Costing Results” has been removed. It will be replaced by the report FCML4H_RUN_DISPLAY_MATERIALS that displays a material list with status and it will be called via the button “Results” in the section “Processing”. 2. Reference Document: navigates to the original business object as of Production Order, Process Order, Product Cost Collect, CO production Order or Purchase Order and so on. 3. Closing History: routes to show the closing history if the closing is cancelled at least once. Apart from the above, the following are substantial changes done in CKM3 screen. No separate view for Cost Components, but integrated in main screen. components relevant for material valuation; by default selection of inventory relevant cost component split. Display of WIP Reduction for material; by default WIP Reduction is hidden; If WIP reduction is displayed, both WIP reduction and consumption of WIP for order are shown in opposite sign in different folder. CKMLQS- Multilevel Quantity Structure screen is not available from the release 1610. A new 2-dimensional distribution logic avoids rounding errors. The new CKM3 will match vertically and horizontally even on level of Cost Components. Price Limiter Logic is accurate on level of Cost Component Split. Change of standard price for materials and activities within the period is supported. We are working on a S/4HANA upgrade project from 1511 OP to 1610. We are currently using material ledger with actual costing. When we try to convert system and data in the middle of month, we discover that, old material ledger data is not converted in new ML tables(MLDOC,MLDOC_EXTRACT etc.). After conversion, we have also some new transactions. When we tried to close this month, we saw that, price differences did not distributed correctly. This means, for this month, actual costs are not correct. Can we say that, if we want to convert any system(older than 1610 OP) that actual costing is already activated, we must do the conversion at the end of month, and before conversion current period must be closed. After conversion we must open new period, and proceed with it. If it is the case, in Turkish market we should discuss this situation for each Conversion customer. Because, in TR actual costing is legal requirement, and most of our customers are using material ledger with actual costing. And for most of them, closing period in the last day of month is not easy(because of late invoices etc.) Could you kindly guide us about this issue? In my organisation, we dont have actual costing active prior to migration to OP 1610 and so have not come across such situation. Hence I request you to raise an oss on the same or else post your query in sap community. Also let us know if you find solution for the same .